Blanching helps make stir-fries such quick-cooking dishes. 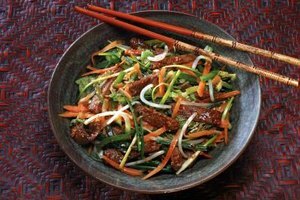 Asian beef recipes, especially those of Vietnamese and Chinese origin, call for blanching the beef. You see this for a couple reasons: to purge impurities from the meat, and to partially cook the meat. When you add raw beef to simmered dishes like pho, the froth that floats to the surface clouds the stock, and when you add raw beef to stir-fries, it creates a food safety issue because the raw beef juice, called purge, comes in contact with all the other ingredients, making it nearly impossible to cook every exposed surface to the safe serving temperature of 145 degrees Fahrenheit. Trim the loose hanging fat from the beef along with any extraneous gristle and connective tissue, and discard it. 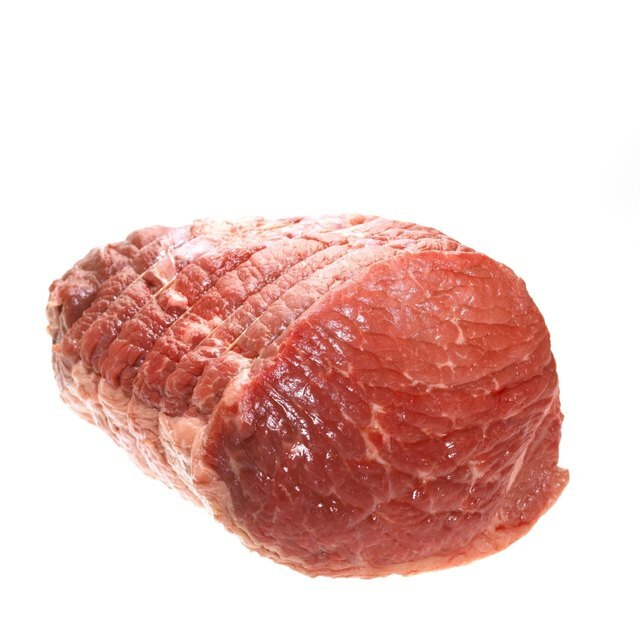 Fill a pot with enough water to completely submerge the beef in and bring it to a boil over high heat. Fill a large bowl or storage container full of ice and cover the ice with cold water. Lower the beef into the pot using tongs. Once the water returns to a boil, start timing the blanching. Blanch the beef for 5 minutes after the water returns to a boil. Skim the froth and scum off the surface -- and there will be a lot of it -- with a large spoon, and place it into an adjacent container for disposal. Take the beef out of the pot and submerge it in the ice water. Let the beef chill in the ice water for the same amount of time you blanched it, or 5 minutes. Add more ice as it melts, if needed. Remove the beef from the ice water and let it drain for a few seconds over the water. Place the beef on your work surface and pat it dry all over with paper towels. Let the beef sit at room temperature for a few minutes, or until the surface dries.